Temuera Derek Morrison MNZM (born 26 December 1960) is a New Zealand actor. He is known for his role as Dr. Hone Ropata on the New Zealand soap opera Shortland Street. He later starred as Jake "The Muss" Heke in the 1994 movie Once Were Warriors and its 1999 sequel What Becomes of the Broken Hearted?. Morrison became known internationally after playing bounty hunter Jango Fett in Star Wars: Episode II – Attack of the Clones (2002) and Commander Cody in Star Wars: Episode III – Revenge of the Sith (2005). Recently, he became known for voicing Chief Tui in Disney's Moana (2016). ↑ Spratt, Amanda (23 October 2005). "Howard Morrison a knight in full voice". Herald on Sunday. Retrieved 19 November 2011. Betros, Chris (17 July 2006). 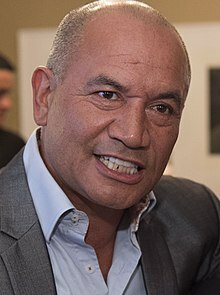 "Once a warrior, Temuera Morrison now New Zealand's best known film star". Japan Today. Retrieved 20 February 2007. This page was last changed on 1 October 2018, at 23:47.